To be honest, the question had never occurred to me before. I don’t normally drink whiskey, and that subtlety is something I never noticed. Combined with the fact I can’t spell out a simple paragraph without a spelling/grammar checker nagging me at every tenth word, I was at a loss. Normally, it’s bad form to answer the main question a mere 100 words into a post. Why lose the suspense? But I’m gonna anyway. In Ireland, our host was proud to proclaim the correct spelling included the ‘e’. He also bragged up techniques for making the Irish libation he claimed made it superior. The Scots have their own opinion. While in Scotland we made an excursion to find out what that is. 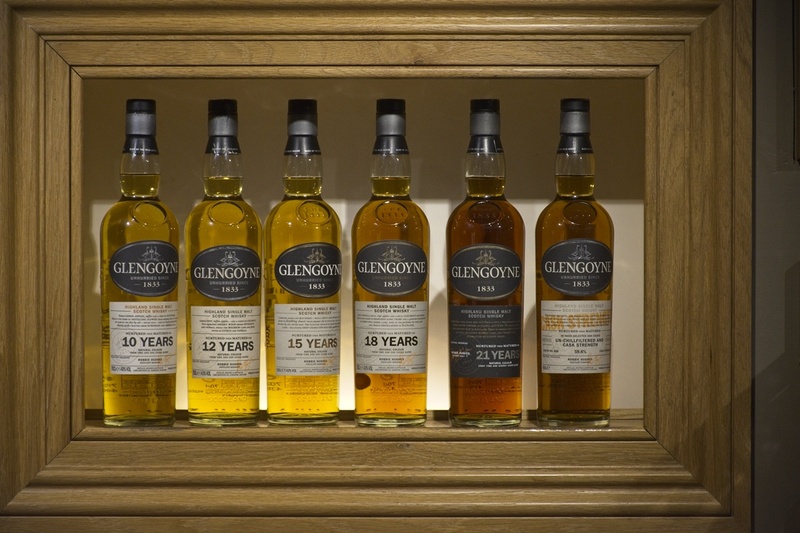 15 miles north of Glasgow, we found the Scots answer to the Irish at Glengoyne Distillery. After warming us up with a shot of whisky, er, make that a wee dram of Scotch, our spirited hosts showed us around. We learned that Scotch Whisky (yes, that’s whisky without an ‘e’) is made primarily from barley. In fact, the initial stages of making scotch reminds me of my own brewing process when making beer. 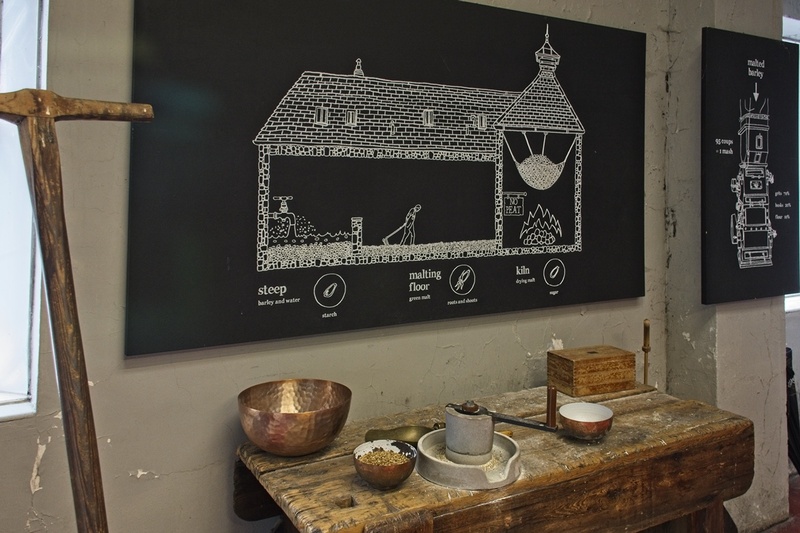 The illustration above shows the malting process for barley. First, they moisten the grains, then give them a few days to germinate. The grains are raked during germination to control temperatures. This stage is rather important; it releases enzymes and softens up the starches, turning all those little rock hard barley grains into something that is more easily crushed and mashed to release their sugars. The right side of the picture shows a fire under a basket. This fire halts the germination and roasts the barley. The level of roasting affects the flavor of the grain. 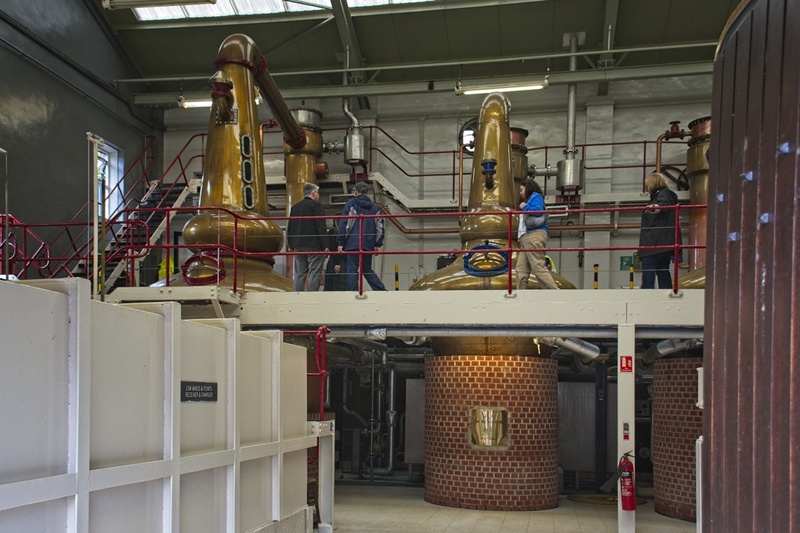 For the Scottish malting process, they’ll also use peat as a fuel for the roasting stage. This imparts smoky flavors – how much depends on how long they use the peat and the type of peat used. And no, I don’t malt barley when I brew; I buy it pre-malted. Scottish breweries don’t make their own malted barley either, malting is a business in its own right. The Irish, for the most part, don’t use peat in the malting process. Historically, the Irish were poorer than the Scots and couldn’t afford pure barley for the brew; they needed to augment it with other grains, depending on what was available. In time, some of these brewers moved the United States where they had similar issues; barley wasn’t easily grown in the Kentucky and Tennessee areas where they landed, and they too needed to augment their grains. And although the grains used and processes and the brew have evolved differently from the Irish homeland, the name remains: for Americans, it’s whiskey with an ‘e’. The next bit after malting is like making beer; mashing the grain. This is nothing like mashing potatoes. Mashing for whisk(e)y and beer involves mixing crushed malted grain with water, making a slurry that looks like oatmeal. The water is held at set temperatures that make those all-important enzymes mentioned earlier happy. Happy enzymes do chemical magic: they convert sugars from starches. There are variations on this process, but that’s the gist. Once the conversion is done, the sweet liquid wort is separated from the spent grains. Fermentation occurs next. After the mash, in the beer process we do a boil and add hops. Whiskey doesn’t have hops, but in both cases the wort is cooled to a temperature amenable to yeast. Those tiny little yeast beasties are the real brewers, they’re the ones that convert the sugars to alcohol. This takes a few weeks, and the yeasts are different between beer and whiskey, but the result is the same. Whiskey ends this stage with a higher alcohol content than beer, but its mere fumes will not make your eyes water just yet. 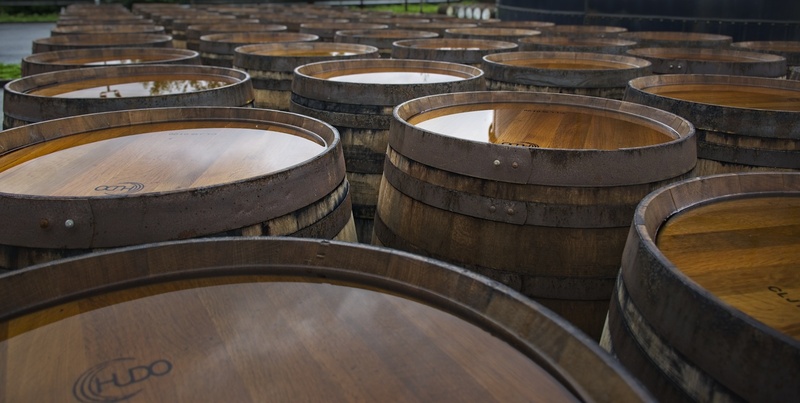 This is where making whiskey departs from making beer. Distillation. 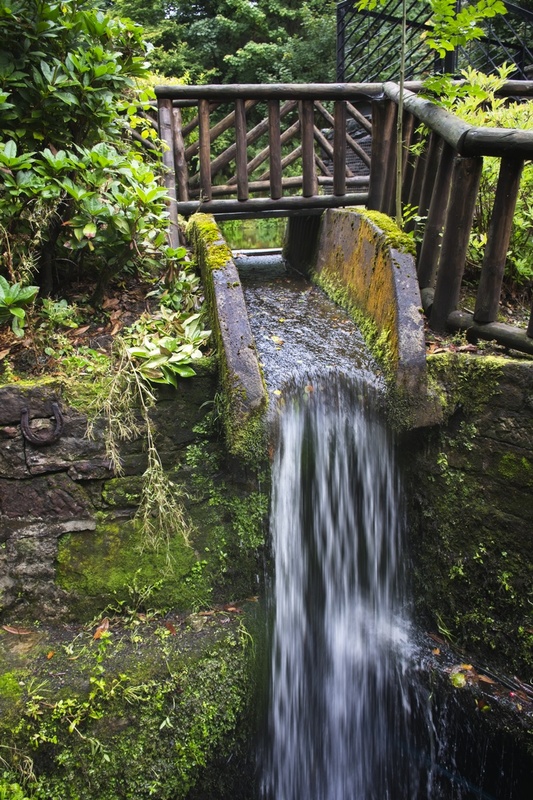 Distillation is done by boiling the brew and causing it to evaporate in cooler piping. This concentrates the alcohol. Following up on the idea anything worth doing is worth redoing, they run the results through the process again. For the Irish even this isn’t good enough, they distill it yet a third time – this provides lighter and smoother booze. I understand that the best results from distillation are in the middle stages; flavors and bouquet are better. The good stuff is pulled off, the early and late stage results are routed into another distillation cycle. Although this is done in a still, it’s still not done. 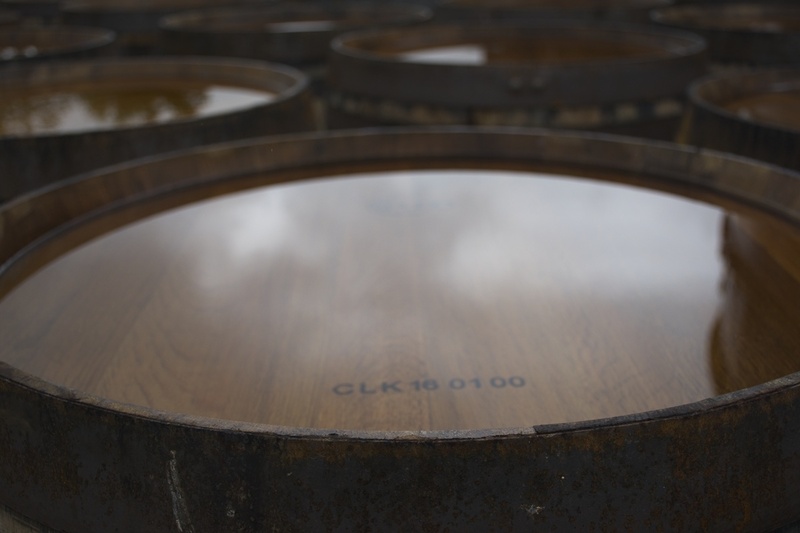 Once pulled off, the spirits are stored in oak casks. Here they age for at least three years and as much as 40 plus years. During this time the whiskey picks up flavor from the oak, the environment, and whatever chemistry the temperature and humidity imparts. Because of this, about two percent of the keg contents evaporates away each year. These losses are called the “angels share” and are one reason older vintages are more expensive. Illustration of how time spent in the keg affects the color and shows the angels share. Is Irish Whiskey better than Scotch Whisky? 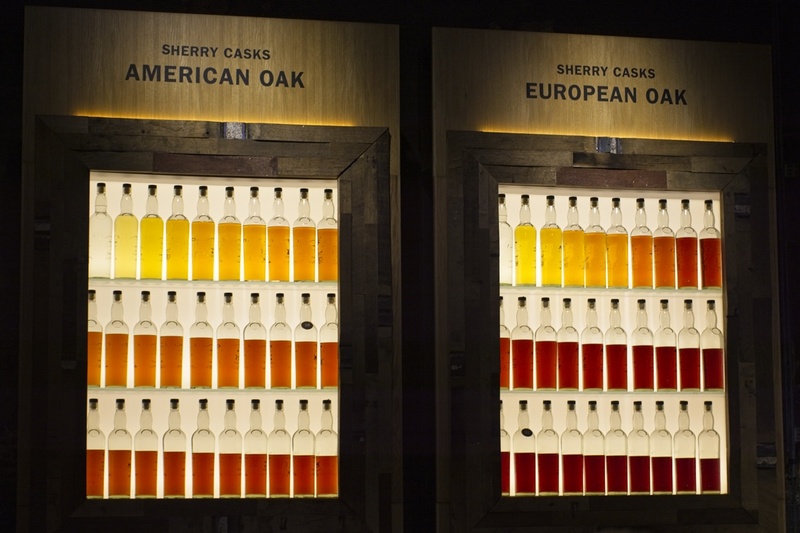 Is American Whiskey as good as either? Does it matter how it’s spelled? These are questions I’ll leave the whiskey/whisky fans to argue. Being a beer or wine sort of guy I recuse myself from the discussion. For me, the biggest challenge is to remember who spells it which way. I’ve heard the Scots are economical, perhaps that’s the ticket: they’ve worked out a way to spell whisky using fewer letters. I enjoyed the comparison of the Irish and Scot distillation methods and close look at preparation of the mash. Thanks, Dave. Starting with a spelling demon you created a wonderful post on the making of whisky, Dave. As you can see, I use the Scottish spelling. Haha! Have a great week! It looks like posts on the making and spelling of whisky, like the beverage itself, may be an acquired taste. Have a good week, Peter, perhaps with a no ‘e’ whisky chaser. Interesting! 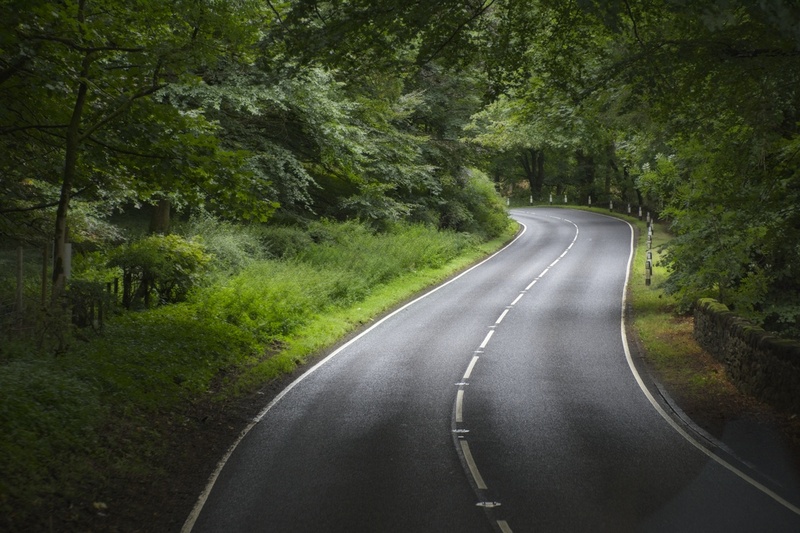 and nice photos, especially the curving road, and the little sluice. No wonder this stuff is so expensive, losing two percent/year for thirty or forty years. The “angel’s share” really adds up, and those angels must be doing barrel rolls up there, after inhaling all that. I also liked those two photos from the excursion, and wondered how to work them into the piece. Now we know why angels have halos (they’re pretty lit), and why their breath smells of spirits. I’ve never developed a taste for whiskey (nor was I quite sure how to spell it! ), as I mostly drink wine. But it was interesting to read your post and learn so much more about how it’s made, and I do know that it’s a very popular drink in Scotland. I have been watching the whiskey making process for quite a few years. My son and his high school buddy started Loon Liquors about eight years ago. I remember you mentioned your son was a distiller in earlier comments. I’m sure you know more about it than me just from watching and chatting with junior, pretty everything I know is embedded in this post. Very interesting! I enjoyed this, having very recently developed a pallet for whiskey (guess I use the Irish spelling!). Lovely photos too. I’ve never really explored whiskey, apart from an unfortunate experience or two when I was young and foolish. Now that I’ve educated my palate with beer and wine, maybe I should explore it (except I’m still not big on the flavor.) Happy exploring! I thought the spelling depended on how many glasses you’d had that evening. If poor spelling is an indicator of inebriation, I must live in a permanent state of drunkenness. (And yes, the spell checker told me I misspelled three words in that last sentence, and misspelled “mispelled”. I’ll probably have a literary hangover in the morning. Super interesting, Dave. The aging illustration with the different barrels and the amount of the angel’s share over time really drives home the concept. Do the Scots and Irish drink their whisk(e)y straight or on-the-rocks? I think they drink it with a little water mixed in, but I’m no expert. I’ve never thought about the spelling before, but if both are acceptable then I guess it doesn’t matter. I don’t usually like whiskey but I’ve tried some Scotch (in Scotland!) that is so smooth. Love that first photo of the road. So dreamy. I only had just the one shot (ok, two, my wife doesn’t like whisky at all and I got hers.) For the rest of the trip I was looking for a good Scottish Ale, one of my favorite styles, with the occasional Guinness for variety. I shot the road photo through the windshield of the bus – we were up front that day. It was a bit of serendipity, but then I did have my camera at the ready. I’m not sure I’ve even tasted bourbon. I rarely drink the hard stuff, and if I do it’s usually rum or tequila. It’s mostly beer or wine for me too. 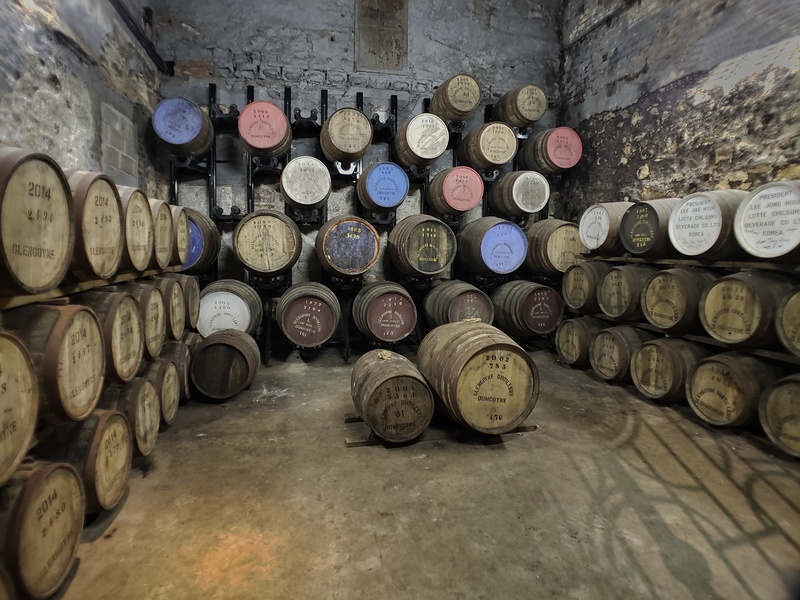 I am definitely not much of a whiskey or whisky fan, so I probably would not have gone along on this tour, but am glad YOU did, so that I could just sit back and read about the whole process and get the benefit of a vicarious education. Thanks Dave! I particularly love the pictures of the old wooden barrels. Something about that shape that is alluring. I can almost smell them just by seeing your photos. I’ve to say, I’d have a good glass of Lagavulin 16 over anything Irish… But a Hibiki over a Lagavulin. Now I happily await your to visit Kentucky and Tennessee. And yes, I like them all whether fashionable or not: Jameson in my coffee, Jim Beam in my Manhattan, and Johnny Walker and Jack Daniels just to sip. I also like dark beers such as Guinness, Newcastle Brown and Yuengling. and some craft beers. No, I am not an alcoholic [not seeming to have a genetic leaning that way] and most bottles seem to last forever in my cupboard. You did a great job with these photos, Dave. I’m not a hard liquor aficionado, but you made it all very clear. Thanks, Lynn. 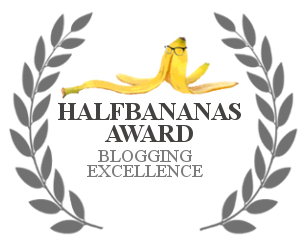 I suppose all those years of doing technical writing helped me distill this down to the essentials, so to speak. I read something about a Scandinavian liquor, aquavit. One brand puts their kegs on an ocean liner for a trip over the equator and back. They say it gives it a smoother taste. Funny how seriously we take our beverages, isn’t it? They say you can learn something every day, I have never been a whiskey drinker which is probably why I have never noticed the different spellings! Before the Irish barman brought it up, I hadn’t noticed it either. It’s nearly always beer or wine for me. I bet if i’d been drinking it I would have noticed.